I took this photo on November 1 - deer on my neighbors lawn. They have been part of our morning or afternoons ever since. This series of articles has emerged to be an interesting collection of ideas relating to recovery of movement, sometimes due to illness but more often from injury. 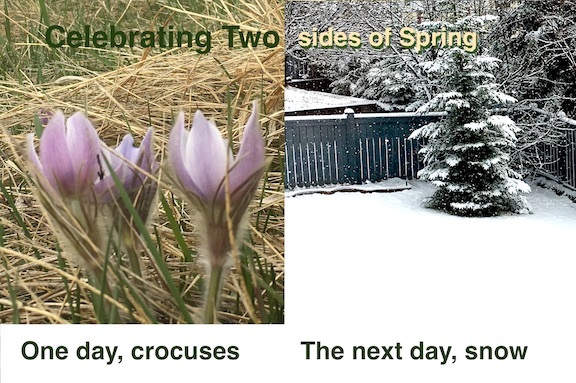 Spring shows us the two sides of Change. One day we will see the grass greening and flowers emerging. Yet on the horizon are rain or show. The very next day we can have a good snowfall, suggesting winter has not left. It is the same with personal change. One moment we feel the budding of new possibilities. And the next, a sense of regressing to previous states. If this yo-yo shifting has happened for you, take hope in the understanding of spring -- That the weather does change and growth becomes abundant. The Theme for our April/Spring Newsletter is listening. In all activities, whether walking, running, swimming, playing instruments, to increase proficiency, we need to increase our ability to listen to the body. One aspect of being human is what Dr. Feldenkrais described as the Elusive Obvious -- some things become clear when observed in new ways. or, the clarity of understanding is associated with the clarity of seeing. Thus I start this newsletter with the challenge to find the rabbit (hare) in the photo at left. It is a kind of metaphor for our way of seeing. If you see it immediately, reflect on what characteristics led you to see the whole all at once? If you do not see it immediately, what characteristics do you find yourself searching for? Some of these articles will be obvious to you, some will be a bit elusive. Some interesting, some not. In any case enjoy the whole. These offerings are the highest quality workshops run by world-class facilitators. The locations and accommodations are always excellent. Your experience can be simply restful, a deeply moving, or even transformational, while in a safe environment. If the workshop date is past, click on the link to the website of the organizer -- perhaps there is a more recent one that is attractive to you!